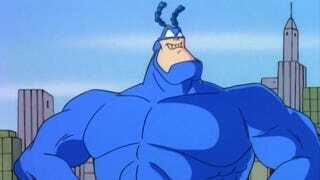 Hello friends, did you like The Tick? With its surreal parodies of superheroes? Well then do we have a quote from creator Ben Edlund for you! We’ve got this show about superheroes [where] we get to have fun with the idea of superheroes by starting with kind of a comedic parody of [an] event-oriented-like universe. It will be darker and more grounded. And it’s going to have a real story, a real hero’s myth. We’re the ones that get to have fun with it and that’s kind of the situation where right now that’s an open field in this area of entertainment. Which, in context, can be read as the show being a parody of the “darker and more grounded” superheroes, where the original was a parody of the wilder parts of comic lore. That said, “more grounded” is not the route we want to see The Tick go down. We would prefer it if this show was, like, Dalí-levels of surreal. Played as seriously as The Dark Knight. That would be fabulous.